You can set up standard Time Based Reminders for your friends to alert them at a Specific Time. 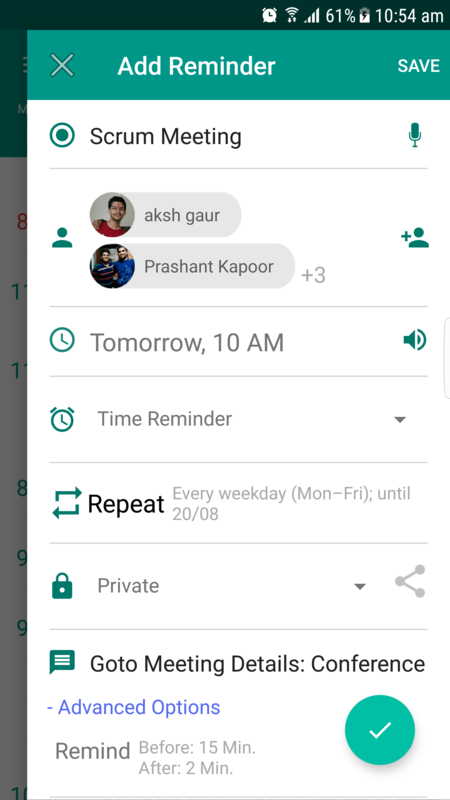 Pi reminder also provides the customization level of setting Repeating Reminders and Multiple Alerts for a single reminder. 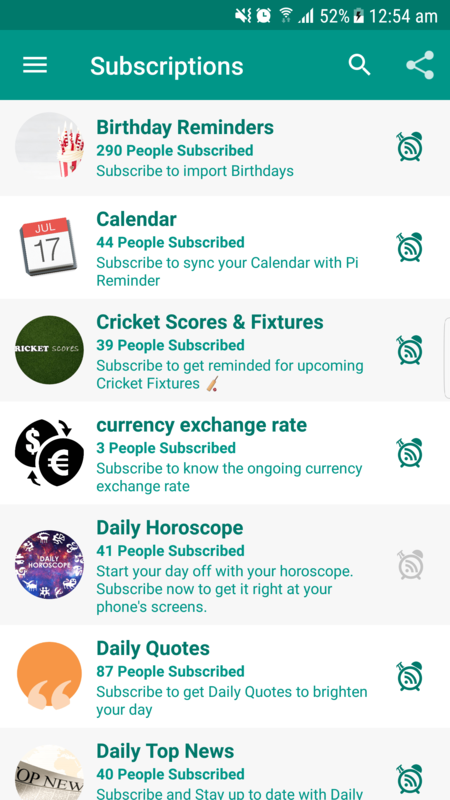 Subscribe to interested Services/People to get automated reminders like Soccer Fixtures, Cricket Fixtures or Birthday Reminders. You can subscribe to other people to get their public reminders or Other people can also subscribe you. Don't have a smartphone, or not an android fan or generally don't have your mobile phone around you ? Don't worry, Pi Reminder is beautifully crafted to its smaller version and is available as a chrome extension. With the same easy and gorgeous timeline UI, it smartly syncs all the reminders on your smartphone and on your browser so missing a reminder is like No Way ! What is Pi Reminder ? Surely we can set Reminders on our smartphone or add task notes for future on our Laptop but what if someone else can add a reminder for us ? Presenting Pi Reminder ! 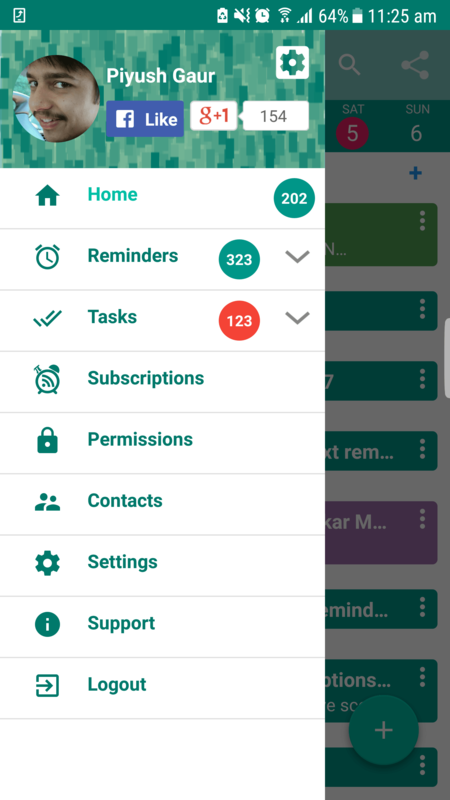 – An application that gives you the power to set up a reminder in your friends’ phones with a single tap! No more worrying about calling people to remind them. And let others care when they have to remind you. For an instance, Alex and Dan are roommates, Alex always pays the electricity bill but he has gone to his native town and wants to remind Dan to take care of it. What he will do ? Either Alex keeps that in mind to eventually tell Dan on phone call or he messages Dan, and then Dan has the responsibility to keep this in mind and pay the bill before deadline. Wouldn't it be better if Alex at that very moment sets a reminder on Dan's mobile for next morning, and saves the pain to keep it in mind and thus eventually avoiding the risk to forget. Dan on the next day is notified with a reminder set by Alex and thus saves paying the penalty. 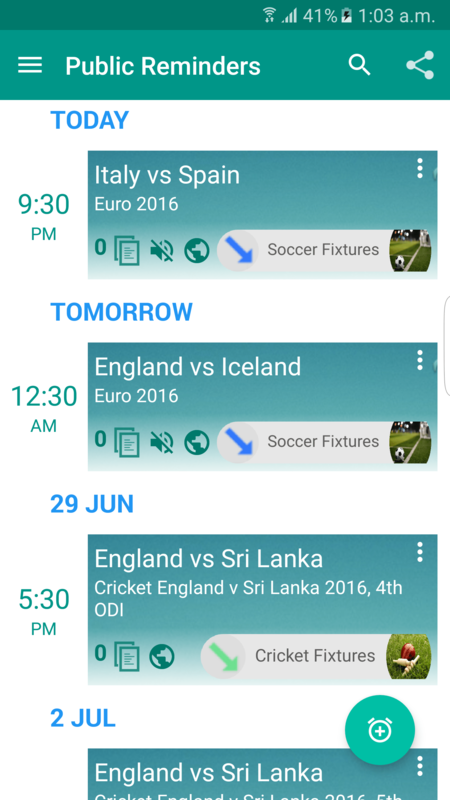 There are many more reasons you would want to have Pi Reminder as your companion. Click the button to know more..
No need to keep that smartphone around you, get reminded while working on your laptop! Have any feedback for us or want to know what's the upcoming feature ? That's great! Give us a call or send us an email and we will get back to you as soon as possible!